On Sunday March 27, 2011, I had the pleasure of DJ'ing the wedding reception of the new Mr. and Mrs. Hendrick and Chi-Chi Moy. The couple selected to hold their celebration at the beautiful Tides Estate in North Haledon, NJ. Regarding the big picture, Hendrick and Chi-Chi wanted a celebration that incorporated traditions of their Asian heritage, but that was also playful and high-energy at appropriate moments. Special touches included a Chinese tea ceremony (where family/friends sit in chairs across from the bride and groom and offer advice to the newlyweds) and Hendrick "serenading" his beautiful bride, accompanied by musician friends of his. Ambient DJ provided music in several zones. The cocktail hour was held downstairs in the Belmont Room where guests enjoyed a delicious spread of food. Our cocktail hour mix included selections by Jason Mraz, John Mayer, Ingrid Michaelson, the Dave Matthews Band, Alicia Keys, Robin Thicke, Air and the Gotan Project. The reception party was held in the Manchester Room, adjacent to the cocktail area. Ambient DJ provided an uplighting package, accenting the classy white paneled wood walls and pillars with alternating red and lavender colors, with our South Beach-style DJ facade and the wall behind the head table (opposite) uplit in blue. The rainbow of colors complemented the multi-colored origami table decorations. The bridal party entered to "I Gotta Feeling" by the Black Eyed Peas, followed by the bride and groom's entrance to "I Made It" by Kevin Rudolph. Hendrick and Chi-Chi immediately went into a special edited version of "Only Hope" as sung by Mandy Moore, performing a graceful ballroom routine that culminated with a dramatic dip! Immediately thereafter, couples enjoyed a dance with the bride and groom to DJ Sammy's "Heaven" (Candlelight Remix). For the Chinese tea ceremony, I played soft background music of Chinese classical music, followed by some atmospheric music from the Buddha Bar V album. Later in the program, Hendrick serenaded Chi-Chi, including a special version of "Nothin' On You." Chi-Chi's cousin, Oliver Forrest who walked her down the aisle and was visiting from London, delivered a moving and articulate toast. Later on, Will "the Thrill" Chung gave a toast that was among the best that I've ever witnessed. The bouquet and garter ceremony was performed with a twist. Given the large number of married couples, only married ladies (bouquet) or guys (garter) were invited to the floor. The catcher of the bouquet or garter then was asked to select an eligible bachelorette/bachelor. This unexpected twist was well-received and effective! After a hard dance set, the action moved outdoors for a "wish lantern" ceremony (see link to the attached video). This ceremony proved to be a dramatic conclusion to the evening! Special thanks to MCs David Lin and Samuel Lee who assisted in making the wedding reception such a success. Shout-outs to Steve and his staff at the Tides Estate; big-ups to photographers Joel and Rita Wiebner and the friendly videographers from Northeast Horizons ! Hendrick and Chi-Chi, I enjoyed working with you and wish you my best in your married life together - you are an awesome couple! 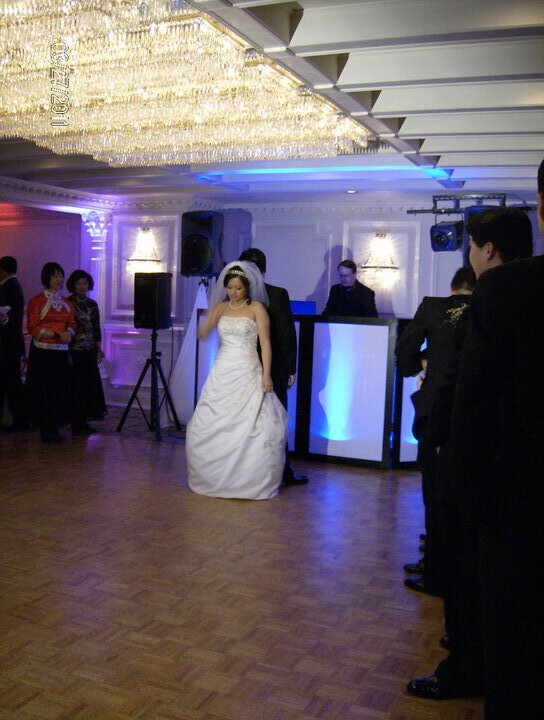 Ambient DJ is an award-winning, boutique style mobile DJ company based in Central NJ that specializes in multicultural weddings or celebrations for those with alternative tastes in music. The Company provides service to New Jersey, Eastern Pennsylvania and Manhattan.